Do you want to know something I’m thankful for today? I never cease to be amazed and thankful for all of you. A few months ago, Lori wrote in and shared that ever since she adopted her CH cat Willow a few years ago, she’s been reading the blog and has picked up a number of great tips. Consequently, she felt it was time to share Willow’s story. Here we go! “I have two other cats, one of which is special needs with a missing foot. I was looking for another special needs kitten when I ran across an entry in Petfinder.com for three sibling kittens that were being fostered in Chehalis, Wash., about an hour and a half drive south of Seattle. I emailed the foster mom and got more information about the kittens. She mentioned that they had cerebellar hypoplasia and had motor skills challenges. Not knowing anything about CH, I got online and read everything I could find about it. I decided that it was a handicap that I could manage, so I make an appointment to meet the foster mom and the three kittens. 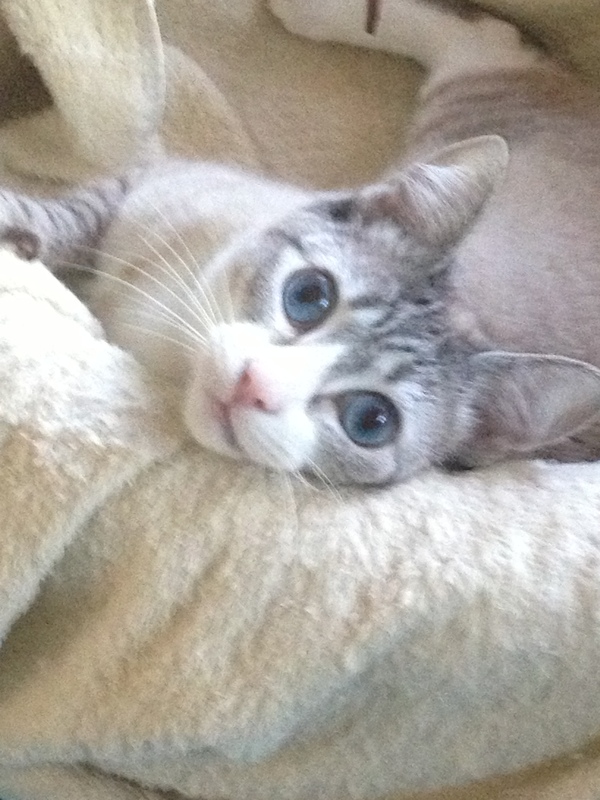 It was very hard to choose only one, but there was a definite connection between us, so I chose Willow, a female dilute Siamese, and took her home. It didn’t take me very long to wonder what I had gotten myself into. She was 12-weeks-old at the time, but she was very small for her age at 2.5 lbs. I was mostly concerned about her lack of strength, and that she might get hurt while I was at work or away from home. That same day I went to Babies-R-Us and purchased a “play pen” so she could be contained, but have enough room to move around. It also gave my other two cats the opportunity to get to know her better, but have some separation so they didn’t feel imposed upon. My male cat, Mack, took to her immediately and has been her best friend ever since. He would jump into the pen and play with her, groom her and cuddle. Although she was still so small and lacked strength to move around, she figured out how to climb and has been climbing onto the bed and the living room couch which has been great physical therapy for her. 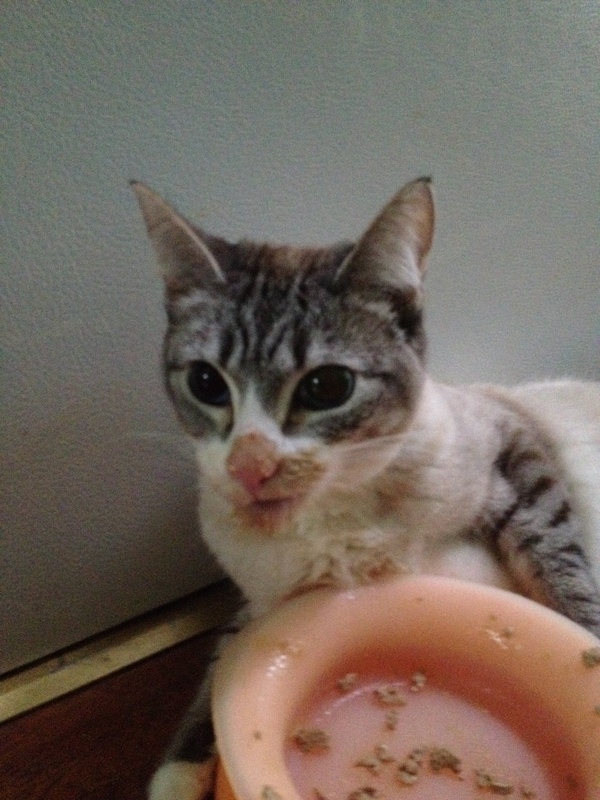 Since her CH is severe, eating and litter box issues were, and still are, a challenge. She cannot walk, or even stand for any length of time. I had to be very creative to make litter boxes and food dishes that would accommodate her handicap and make changes as she grew and became stronger. I finally created a permanent box out of a clear storage container and added a ramp for easier access. She has learned to lean on the side to stand and go, but she often lays down as well. I also purchased a Booda Clean Step dome box that has an easy entry for her. I discovered a food bowl online that is made from silicone and reduces the possibility of broken teeth or hurting herself when she falls into the bowl. Last July she began to have seizures. I took her to a veterinary neurologist who put her on a small dosage of phenobarbitol. That stopped the seizures for a couple of months, until they started up again. The neurologist doubled her dosage and so far, she is holding. The addition of pills to her diet twice a day has complicated the whole feeding process even more. Plus the fact that during her bout of seizures, she lost three of her for canine teeth, so she has only one left. She prefers to stand to eat, but is physically unable to do so. I have experimented with a feeding box that gives her walls to lean up against, but she doesn’t really like it, and appears to feel too confined. I often sit with her to help her focus on the food and pills, and also to keep the other two cats at bay while she finishes her meals. She turned 2-years-old a couple of months ago, and is truly a joy. She has helped me to become much more patient. She continues to try walking and standing, and has figured out the wide-leg stance that other CH cats use to get around, so eventually she may become more mobile. The whole concept of having a “handicat” was daunting at first, but now my other two cats and I are used to the changes we had to make to accommodate Willow. I wouldn’t change a thing. I always love hearing about another sucessful CH adopter. Thank you for sharing your baby’s story. Wonderful stories. My Clarence who will be 6 in May, is severe CH and would not give him up for the world. He is such a joy and I love him dearly.